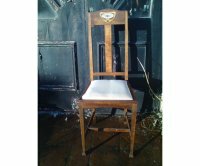 A rare Art Nouveau side chair with a beautiful Art Nouveau maiden embossed to the back rest and seat. George Montague Ellwood, made by JS Henry with arched top and oval Mother of Pearl inlays, sinuous arms with conforming seat details to the side and subtle curve to the front, strengthening uprights between and stylised floral inlay to the back splat. Original fabric, labled. A pair of Arts and Crafts armchairs with stylised floral details to the back inlaid with Abalone, Walnut, Boxwood and Stained green Sycamore. 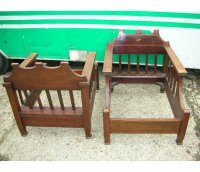 A near pair of Arts and Crafts Mahogany armchair's. Both with stylised floral inlays and one with inlaid hearts. The straight arm version has No 1877 and the shaped arm version has No 1881 in hand writing. 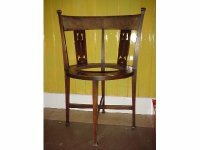 A rare side/bedroom chair attributed to Josef Maria Olbrich with stylised floral inlay to the back. 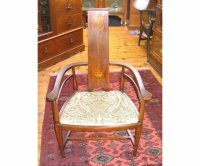 A stylish Arts and Crafts armchair made by J.S.Henry with stylised floral inlays to the back and arms, a semi-circular top with a subtle curve to the entire back and neat narrowing back legs and square tapering front legs. Professionaly re-upholstered in a quality Burgandy hide. 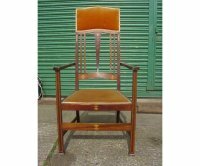 Set of ten and a set of four Morris and Co oak dining chairs designed in the offices of Richard Norman Shaw, possibly designed by W. Lethaby. Circa 1890. £POA. They match very well and could be used as a set 14. 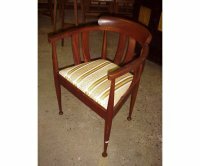 These chairs have all been restored and are all ready for upholstery of your choice. 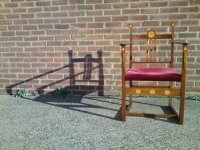 A pair of Mahogany armchairs in the style of Morris and Co with inlaid details through out, ready for upholstery. 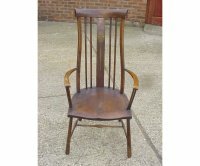 An Arts and Crafts armchair attributed to Shapland and Petter with a pewter heart to the centre splat. Six Liberty and Co Walnut Arts and Crafts Windsor armchair featured in the Liberty and Co Yule Tide gifts catalogue of 1895-6, and also in the Liberty Design book by Barbara Morris page 109, with original green finish. 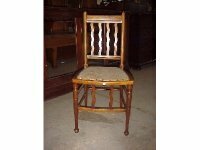 A good quality Windsor armchair attributed to Liberty and Co with well designed back supports. There is an identicle armchair in JEREMY COOPERS Victorian and Edwardian Furniture and Interiors page 209 illustration 575 where it is shown on display at the Essex and Co showrooms. The showrooms were designed by CFA Voysey. 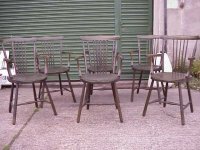 Set of four Liberty and Co Walnut dining chairs. 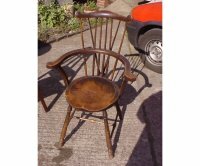 Art and Crafts Walnut armchair probably made by William Birch. 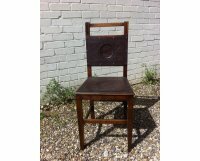 The seat has now been proffessionaly re-covered in a Wine coloured leather. 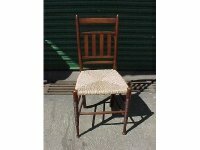 Walnut side chair made by William Birch High Wickham with re rushed seat. An Arts and Crafts armchair with stylised floral inlays and floor stretcher attributed to J S Henry. 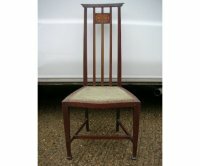 An inlaid mahogany armchair with original fabric to the seat made by William Birch of High Wycombe and probably retailed by LandCo. 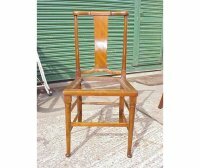 A rare Arts and Crafts Liberty and Co armchair a variation is shown in the Liberty style book with sylised inlay, superb shaped back supports with twin turned arm supports a wonderful flowing lines, the inlay possibly after a design by Ballie Scott.